The hexagram formed by the combination of two equilateral triangles; used as the symbol of Judaism. It is placed upon synagogues, sacred vessels, and the like, and was adopted as a device by the American Jewish Publication Society in 1873 (see illustration, Jew. Encyc. i. 520), the Zionist Congress of Basel (ib. ii. 570)—hence by "Die Welt" (Vienna), the official organ of Zionism—and by other bodies. The ḥebra ḳaddisha of the Jewish community of Johannesburg, South Africa, calls itself "Ḥebra Ḳaddisha zum Rothen Magen David," following the designation of the "red cross" societies. The Jewish view of God, which permitted no images of Him, was and still is opposed to the acceptance of any symbols, and neither the Bible nor the Talmud recognizes their existence. It is noteworthy, moreover, that the shield of David is not mentioned in rabbinical literature. 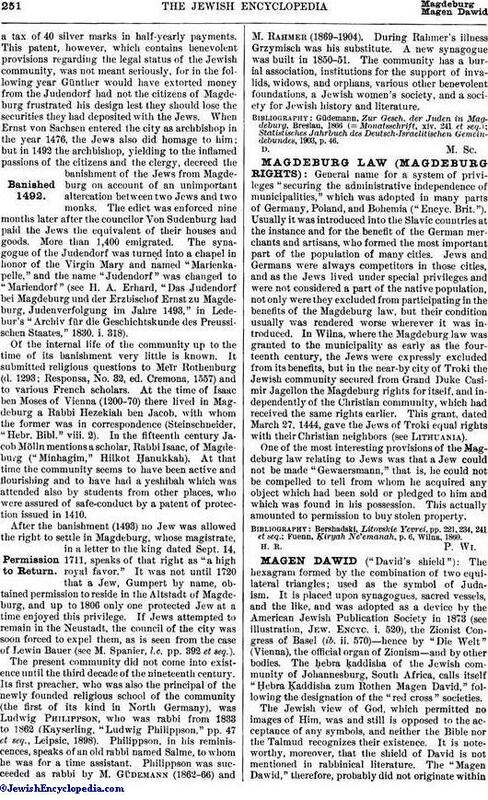 The "Magen Dawid," therefore, probably did not originate withinRabbinism, the official and dominant Judaism for more than 2,000 years. Nevertheless, a David's shield has recently been noted on a Jewish tombstone at Tarentum, in southern Italy, which may date as early as the third century of the common era (see Herbert M. Adler in "J. Q. R." xiv. 111). The earliest Jewish literary source which mentions it, the "Eshkol ha-Kofer" of the Karaite Judah Hadassi (middle of the 12th cent. ), says, in ch. 242: "Seven names of angels precede the mezuzah: Michael, Gabriel, etc. . . . Tetragrammaton protect thee! And likewise the sign called 'David's shield' is placed beside the name of each angel." It was, therefore, at this time a sign on amulets. A "Magen Dawid" from a "Mizraḥ." In the magic papyri of antiquity, pentagrams, together with stars and other signs, are frequently found on amulets bearing the Jewish names of God—"Sabaoth," "Adonai," "Eloai"—and used to guard against fever and other diseases (Wessely, "Neue Zauberpapyri," pp. 68, 70, and note). Curiously enough, only the pentacle appears, not the hexagram. In the great magic papyrus at Paris and London there are twenty-two signs side by side, and a circle with twelve signs, but neither a pentacle nor a hexagram (Wessely, l.c. pp. 31, 112), although there is a triangle, perhaps in place of the latter. In the many illustrations of amulets given by Budge in his "Egyptian Magic" (London, 1899) not a single pentacle or hexagram appears. The syncretism of Hellenistic, Jewish, and Coptic influences did not, therefore, originate the symbol. It is probable that it was the Cabala that derived the symbol from the Templars (see Vajda in "Magyar Zsidó Szemle," xvii. 314 et seq. ; German reprint in Grunwald's "Mitteilungen der Gesellschaft für Jüdische Volkskunde," x. 138 et seq.). The Cabala, in fact, makes use of this sign, arranging the Ten Sefirot, or spheres, in it, and placing it on amulets (see illustrations, Jew. Encyc. i. 181, 550; iii. 475). 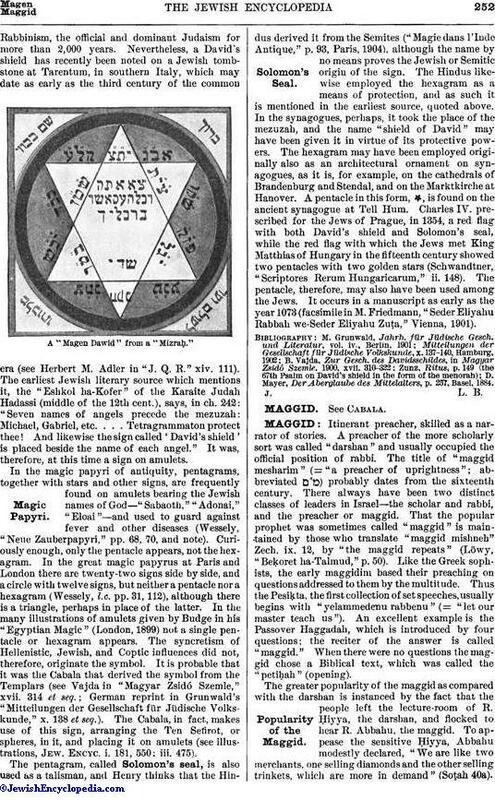 The pentagram, called Solomon's seal, is also used as a talisman, and Henry thinks that the Hindus derived it from the Semites ("Magic dans l'Inde Antique," p. 93, Paris, 1904), although the name by no means proves the Jewish or Semitic origin of the sign. The Hindus likewise employed the hexagram as a means of protection, and as such it is mentioned in the earliest source, quoted above. In the synagogues, perhaps, it took the place of the mezuzah, and the name "shield of David" may have been given it in virtue of its protective powers. The hexagram may have been employed originally also as an architectural ornament on synagogues, as it is, for example, on the cathedrals of Brandenburg and Stendal, and on the Marktkirche at Hanover. A pentacle in this form, , is found on the ancient synagogue at Tell Hum. Charles IV. prescribed for the Jews of Prague, in 1354, a red flag with both David's shield and Solomon's seal, while the red flag with which the Jews met King Matthias of Hungary in the fifteenth century showed two pentacles with two golden stars (Schwandtner, "Scriptores Rerum Hungaricarum," ii. 148). 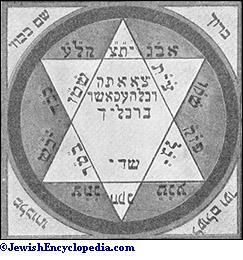 The pentacle, therefore, may also have been used among the Jews. It occurs in a manuscript as early as the year 1073 (facsimile in M. Friedmann, "Seder Eliyahu Rabbah we-Seder Eliyahu Zuṭa," Vienna, 1901). D. Mayer, Der Aberglaube des Mittelalters, p. 257, Basel, 1884.